Sunset fills the sky with soft pastel colours above the Niagara River where the Horseshoe Falls in Ontario, Canada cascades over the high rock ledge. The beauty and power of the Horseshoe Falls in the City of Niagara Falls, Ontario in Canada can never fully be explained and appreciated until one has seen it for themselves. Soft shades of hues adorn the sky at sunset as the mist rises above the Horseshoe Falls after the water drops one hundred and seventy-three feet into the Niagara River. The Horseshoe Falls was given its name due to the shape of the landscape which spans approximately 2,200 feet in width. In the center of the falls, the water is about ten feet deep and when the Niagara River reaches the crest, it cascades downwards at a speed of about twenty miles per hour. 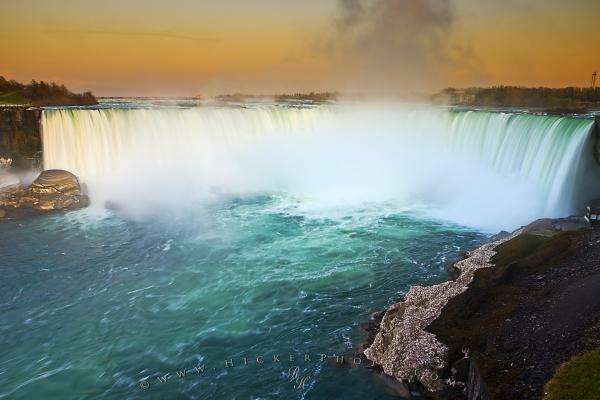 Photo of a soft sunset above the Horseshoe Falls in the City of Niagara Falls in Ontario, Canada. Pictures from photo gallery "Niagara Falls Pictures"
This picture is part of the photo album "Niagara Falls Pictures" - there are more beautiful images waiting for you. ... The other ten percent makes its way over the cliffs of the American Falls which are also very pretty. Many people consider Niagara Falls in Ontario, Canada to be one of the most romantic places in the world and many honeymooners jet set to the region to fulfill their dreams. The nightly illumination of the falls is spectacular and after seeing the falls during the day either from the viewpoints, behind the falls or on a boat, the show at night far surpasses your expectations.Horseshoe Falls along the Niagara River at dusk, Niagara Falls, Ontario, Canada. Please make sure to see all my pictures of the Niagara Falls in Ontario, Canada. I photographed this photo with the digital SLR camera model Canon EOS-1Ds Mark III, aperture of f/9.0, exposure time of 6/10 sec. on ISO 50, as always I used a original Canon Lens, the focus lenght for this picture was 25mm.